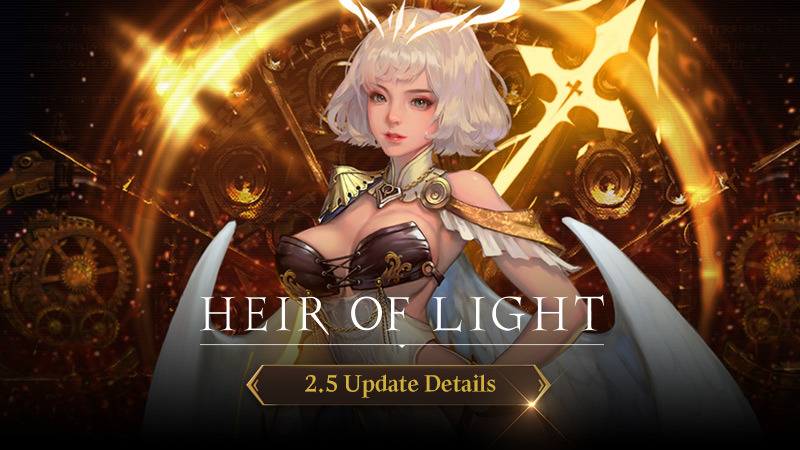 Here are the details on v2.5 Update of Heir of Light. 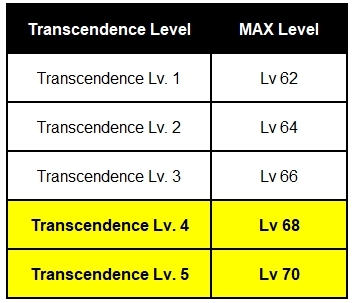 > Transcendence Level has increased from 3 to 5. > Method of Transcendence and materials are same as before. > Co-Destruction system is being added to Infinite PvP. > Co-Destruction is a new system that prevents the activation of passive skills for identical Servants of the same Element on opposing sides. > However, if they are at different Transcendence stages, only the lower level Servant’s passive skill will not activate. > Co-Destruction only applies to Infinite PvP BETA. > Co-Destruction stays active until the battle has ended, even upon the death of the Servant(s) that activated it. > When Co-Destruction is activated, the following icon will be displayed next to the Servant's portrait. > Awakening Dungeon 12th Floor has been added. > Awakening Dungeon 12 Floor Team will be saved same as 11th Floor. > A new option has been added to the Repeat Battle feature for Awakening Material Dungeon Floors 11 and 12. > The [Use Karats to Continue] option is now available in the Repeat Battle options menu. > You can enter up to 3 additional times upon choosing this option. It will cost 50 Karats per entry for 11F and 100 Karats per entry for 12F. > [6★ Servant Skill Usage Only] feature during Auto-Repeat has been added. > This feature will only allow 6★ servants to use their skills. > An option to Auto-Replace Servants that reach Max Level during Repeat Battle has been added. > If a selected Servant reaches Max Level during Repeat Battle, the battle will continue once the Servant has been swapped for a designated replacement. > If no Servant is selected before starting the battle, Auto-Replace will not take place. > You must select at least 1 option each from the [Current Grade/Origin Grade] section of the Auto-Replace Settings. Ex) By selecting Origin Grade 3★, Current Grade 3, 4, 5★, a Servant that has an Origin Grade of 3★ while being 3, 4, 5★ will be used as a replacement. > Tap the [Confirm] button afterwards to save your settings. > By selecting the Grade of the replacement Servant, you can check how many of that Grade is available from your Inventory. > Skill Buns, Mini Skill Buns, and Servant-specific Skill Buns are not eligible to be replacement Servants. 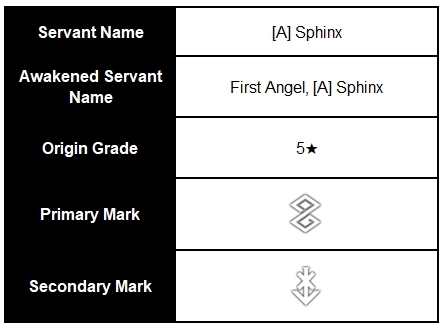 > New Servant, [A] Sphinx the First Angel, has been added. 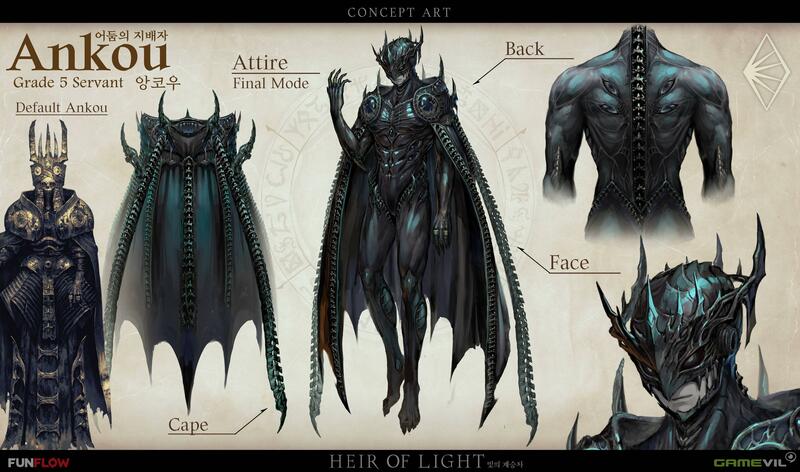 > Ankou the Ruler of Darkness Avatar has been added. > Ankou the Ruler of Darkness Avatar is on sale for $9.99 as a New Avatar Promotion. 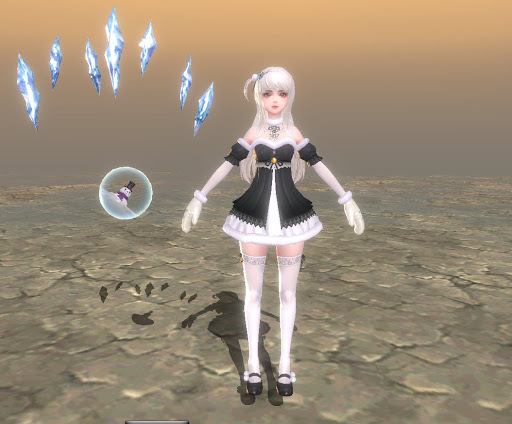 > Winter Sinistra Avatar sale has ended and can be purchased in the Shop for $14.99. > Attack Transcendent Summon Stones and Loyal Transcendent Summon Stones have been added. > Attack Transcendent Summon Stones summon 5★ DPS Servants, while Loyal Transcendent Summon Stones summon 5★ Tank, Support, and Healer Servants. > The new Attack and Loyal Transcendent Summon Stones will not summon new 5★ Servants from after the 2.4 update. > This item will not be sold in the Shop and can only be acquired through specific events. > Several Servants have been adjusted and balanced. > The effect of [Increase Damage Received] has been improved due to the change in calculation formula. 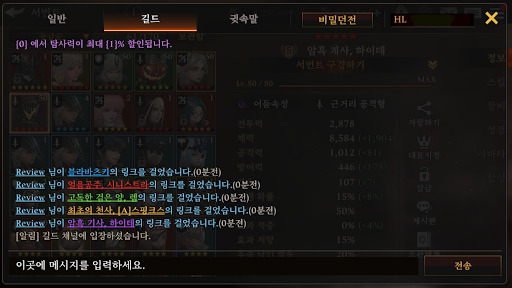 > Even if you had same stats before the update, the damage dealt will increase as Crit Damage & [Damage increase] from Skill Up Effect increases. > Overall damage has been increased due to the improvement of [Damage Increase] passive skill. > [Damage Increase] amount has been changed due to the Servant Balance. 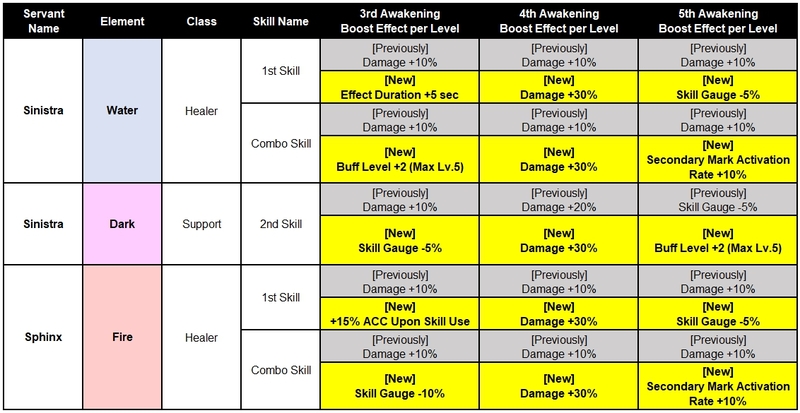 > Several 4~5★ servants' Skill Enhance Effect has been improved. 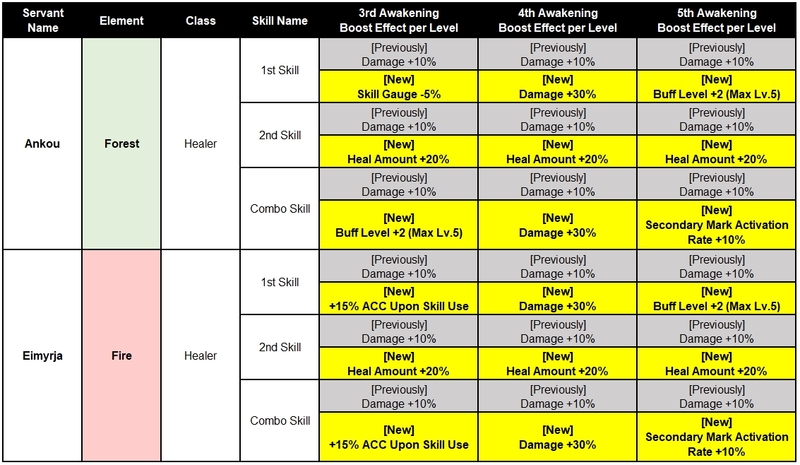 ② 3rd / 4th / 5th Awakening Display Effect Added. > 3rd / 4th / 5th Awakening Display Effect for following servants have been added. 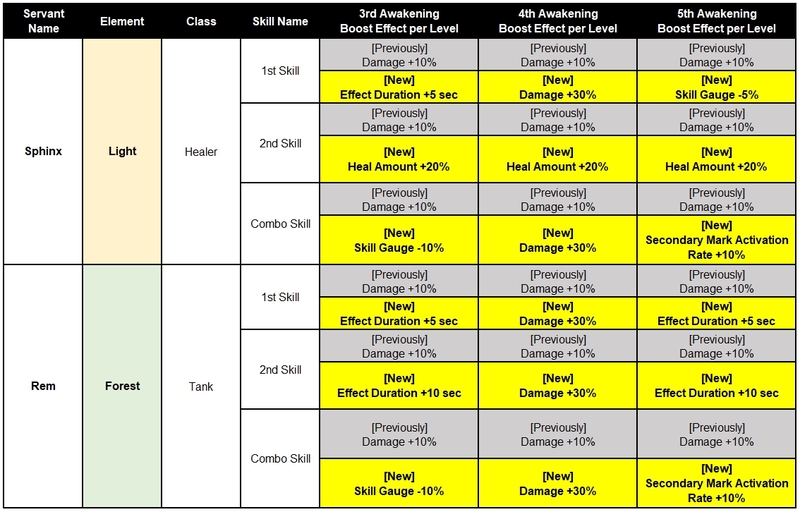 > Relation Effect for several servants has been added and improved. ① 4~5★ Servant's Relation Effect has been improved. 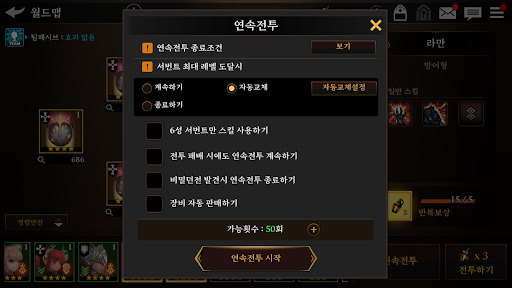 ② Relation Effect for Enoch and Executioner has been added. > 5★ Servant rate from Twilight Summon Stone and Rate+ Summon has been increased. > Special Servant Rate for Rate+ Summon has been increased. > Max Stat Cap for Accuracy and Resist has been increased. > Accuracy and Resist stat can go over 100%. > The stat will be displayed in Orange when it reaches or goes over the Max Cap. > When the Effect Accuracy Rate is higher than Effect Resist rate, it will still have 15% Resist Rate. > When the Effect Resist Rate is higher than Effect Accuracy rate, it will still have 10% Accuracy Rate. Ex) Resist 200% & Accuracy 100%. The Resist is 100% higher than the accuracy, however, because the max rate is 90%, you will have the accuracy rate of 10%. The Accuracy rate is 100% however, the minimum rate of Resist is 15%, so you will have 80% Accuracy Rate. > Resist stats in Gears (Primary / Secondary) and HP stats in Gears (Secondary) have been increased. 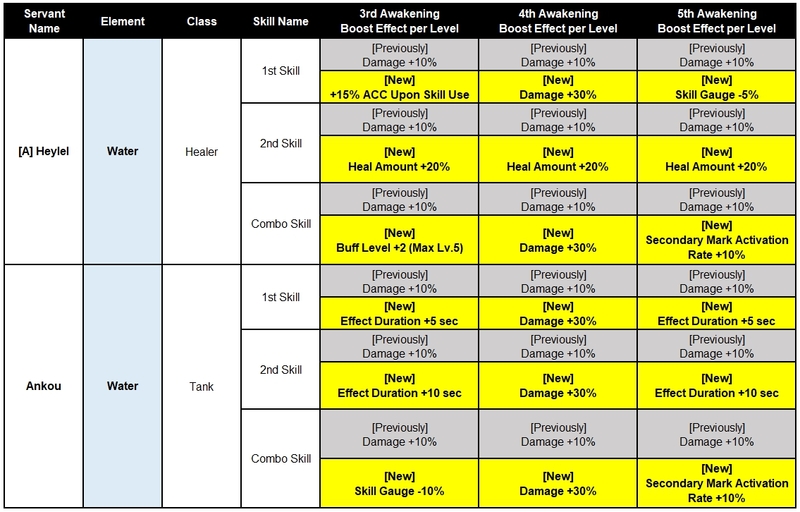 > Gears with Primary Stat of Resist will be changed according to the chart below. 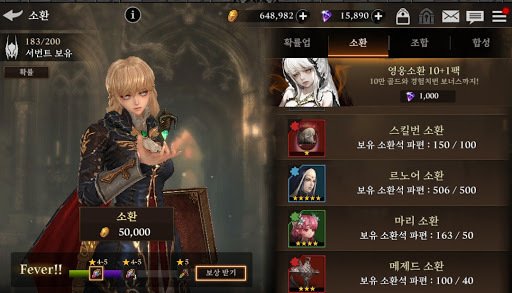 > CP displayed for Servants has been changed due to the change in CP calculation formula. > CP has been changed according to servant's stats. 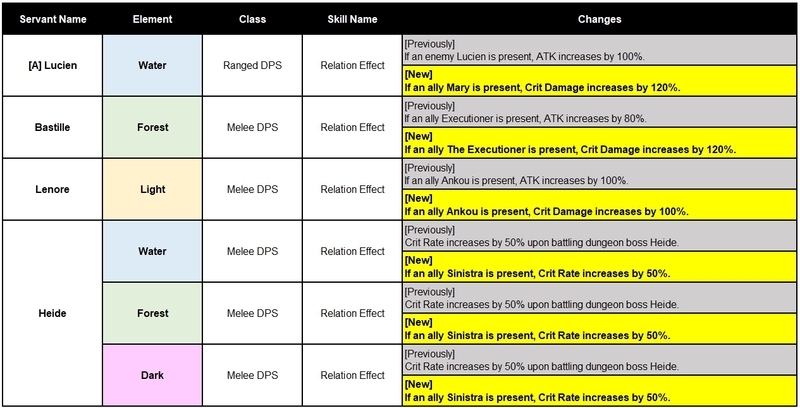 > ATK stat and SPD stat effect on CP has been reduced and increased HP, DEF, Resist, and Accuracy Stat effect on CP. > Increased the rate of Craft Materials and decreased gear rate on Sanctuary Tiles. > Decreased Materials required for [Light] / [Dark] Select Summon & [Fire] / [Water] / [Forest] Select Summon. > Additional Requirement to enter the Awakening Dungeon 11th Floor has been added. 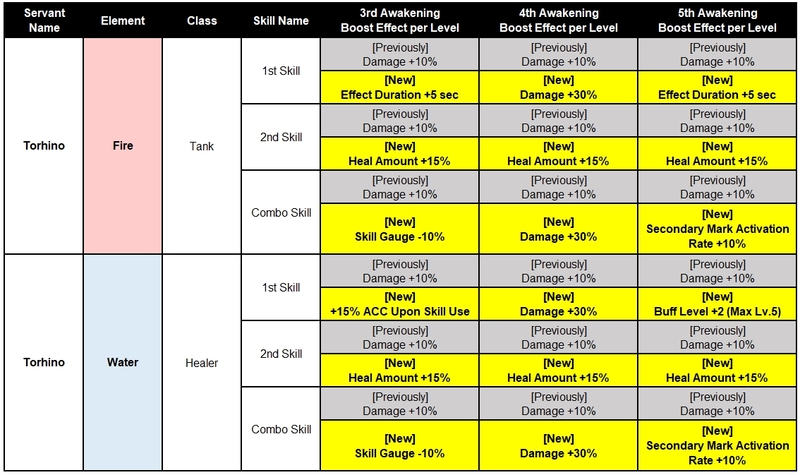 > "Faltering Calamity" skill has been changed do to "Def Ignore" damage in Awakening Dungeon 11th & 12th Floor. > [State Clear] Quest will be changed due to the removal of tiles. (Shine of King Derik 1-9 Quest has been reorganized. > Star Rewards requirement have been adjusted due to the removal of tiles. > Press [▼] button to change the Combo Skill Mark. 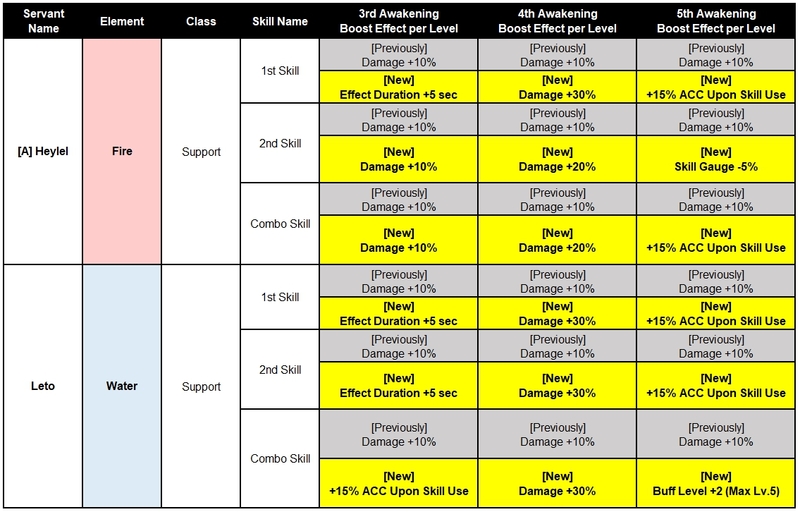 > Changed Combo Skill Mark will be applied to all Contents. > Heal Skill will be prioritized over Combo Skill in Infinite PvP. > Combo Skill will be prioritized over Heal in PvP. > Team will be saved per World Raid. > You must set your World Raid Teams again due to the addition of feature to save Teams. > Friend Invite 2x Reward Event has ended. > Requirement to write a servant review has been changed. > Servant Reviews have been cleared due to the changes. > Color indicators have been added to display servants according to their element in Chat. > Servants that were petrified due to the Petrify Gear will be immune to petrify for the next 25 seconds. > Battery Saving Mode will be deactivated when any device buttons are pressed or when you receive a call. > Press the Battery Saving Mode to activate the Battery Saving Mode again. > Battery Saving Mode will deactivate when all valors are used or when all auto-repeat counts are used. > You can now view user info by just clicking on the servant icon from the User info. > Quality of Winter Sinistra Avatar for [Dark] Sinistra has been improved. > Google Account Log in option has been added for iOS devices. 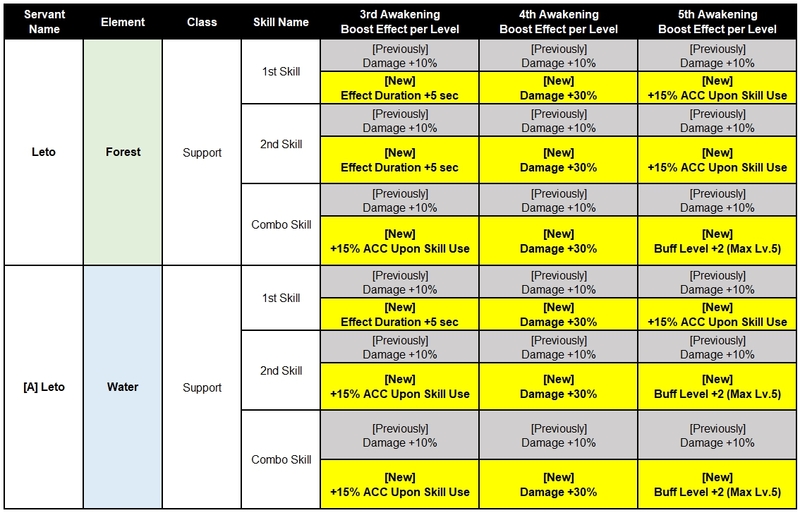 > Relation Effect will be activated after 4th Awakening. > A message will be displayed to indicate the location of servants when trying to use as Evolve and Enhance Materials. > Location Message will be displayed under Error Message. > New Rate+ Summon Category has been Added. > New Servant Pack has been added to the shop. > New Servant Pack will be available for limited time only. > Double Summon Shard Pack has been added to the shop. > Receive double the Servant Shards from Explore for 7 days. > Double Summon Shard Pack will be available for limited time only. > The duration of 7 days will start from the time of the purchase. > Contents in Twilight Summon Packs has been increased. > Gear Pack has been revamped. > Changed to select Gear Set, Gear Part, and Main Options. > Gear Pack will be available for limited time only. > Fixed an issue where equipping/unequipping an Avatar caused a locked Servant to become unlocked. > Fixed an issue where using consecutive enhancement more than 20 times with Nox App Player caused consecutive enhancement to crash. > Fixed an issue where going back in PvP Log after preparing for battle caused the wrong season ending time to display. > Fixed an issue where Japanese characters were not properly displayed during Infinite PvP entry if the game language was Korean. > Fixed an issue where if you didn't enter the Lobby after the date changed, the effect of not spending Valor after midnight from a special reward did not go into effect. > Fixed an issue where if the ending pop-up did not display upon cancelling Repeat Battle, pressing Retry had Repeat Battle continuing. > Fixed an issue where the text displayed upon a Servant at 3rd-5th Awakening and having a Combo Skill buff active using Combo Skills was incorrect. > Fixed an issue where you could not Dismiss a Servant that was Training upon quitting the Guild. > Fixed an issue where the screen appeared to freeze when entering Repeat Battle Power Saving mode after purchasing items/entering the package shop using the menu to the right of the Lobby. > Fixed an issue where Rhamaan and Gretel were shown as 1★ during the Tutorial. > Fixed an issue where Water [A] Heylel's 1st skill's growth effects were incorrectly applied. > Fixed an issue where Medjed's Combo Skill did not deal damage to the opponent. > Fixed an issue where the pause window would occasionally pop up during and stop Repeat Battle by preventing the pause window from appearing altogether. > Fixed an issue where using a melee-viewpoint for the camera during Exploration caused the camera angle for Guild Dungeon mid-boss/boss fights to be in that angle as well. > Fixed an issue where the camera for Guild Dungeon mid-boss/boss moved too slowly from too far away and thus disrupted the image. > Fixed an issue where the discrepancy between server time and device time caused the timestamps in chat for Servant success/enhance/Mystery Dungeon was incorrect. Last edited by CM_Heylel; 01-21-2019 at 03:48 PM.